Before the Misfits, I didn’t really care much about punk music (I guess I still really don’t, this band seems to be the exception). BUT… I was a huge wrestling fan and they became involved with WCW and a wrestler called Vampiro (who used their “Kong at the Gates” song as his entrance music). Couple that with the fact that a freshmen girl I had an art class with was a huge fan of punk & the Misfits… Well, destiny was calling out for me to get this recently released album. 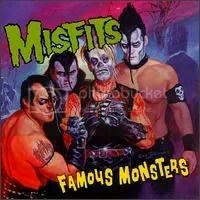 It’s not too bad, not a favorite album of mine and while I’ve gone back and gotten some of their earlier works, I wouldn’t call the Misfits a favorite of mine, though I do think they have some really great songs here and there. This album is quite a departure from the Glenn Danzig version of the band. Sure, the punk rock is definitely still there and so is the campiness of it all, but the danger and excitement is gone. In it’s place we get 50s doo wop & rockabilly meets punk rock, which works quite well on a song like “Saturday Night”, which is about as close as a ballad you’ll get from this band. Props to the band for giving a nod to the great Pumpkin Head movie in, what else, “Pumpkin Head”.